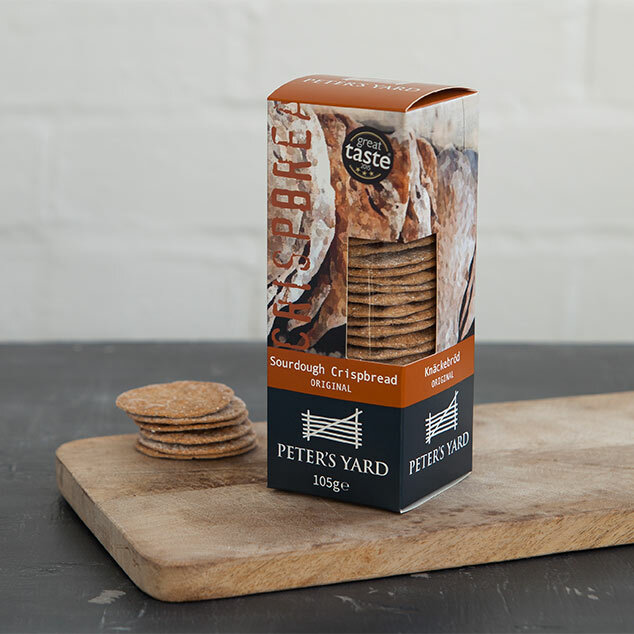 This selection of sourdough crispbread is inspired by our love of Sweden, the home of crispbread. We use simple, natural ingredients including organic flour, organic fresh milk and our precious sourdough, which is allowed to ferment for 16 hours before each batch is made. Baked until perfectly crisp, they are the natural choice for a well-balanced cheese board. Spelt & Poppy Seed complements the flavour of a mild crumbly cheese like Caerphilly while Charcoal & Rye pairs beautifully with soft cheeses such as goat’s cheese or a ripe Brie. Our Original recipe is the perfect partner for any cheese. The Great Taste Award judges awarded it 3 stars and described it as “the best biscuit for cheese out there”. Selection Box with 3 recipes and shapes of small sized crispbread in individually wrapped trays (265g).